From 4 to 6, how things will look in September. The Community is pleased to announce that it will have 4 Lay Members form September. The Prior, Canon Mark Soady has selected Michael Topple from Colchesterand Adrian Price from Hertfordshire to join Sam Paterson and Amy Pope; to work alongside him and the Sub Prior, Deacon Sarah Gillard. Announcing the news Fr Mark said, “We had a wonderfully strong field to choose from and so there was no hesitation in going up to 4 Lay members. Both Adrian and Michael will be a great addition to the team, and bring with them a great deal of potential. I look forward to welcoming them in September”. Michael & Adrian will be Commissioned by The Rt Revd Richard Pain, The Community’s Episcopal Visitor & Bishop of Monmouth at a service in the Priory Churchon September 4th. The 70th Anniversary of VE Day will be marked at the Priory Church as part of the nationwide celebrations. Our bells will ring out with Cathedral and church bells across the UK from 11am on May 9th. 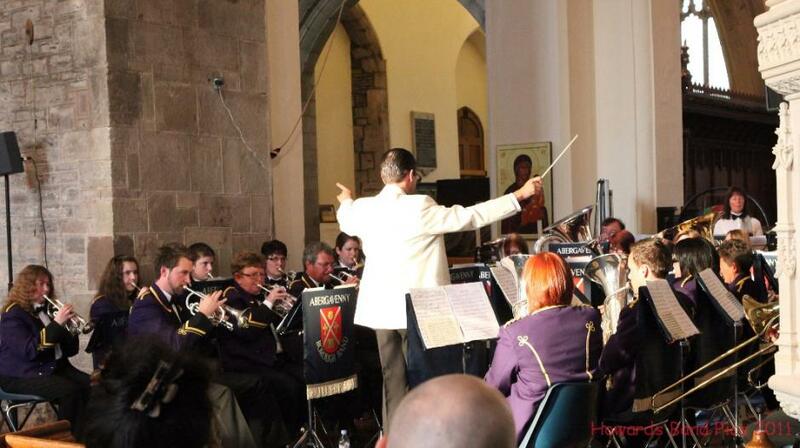 On Saturday, May 9th – We welcome Abergavenny Borough Band with Youth Band & Choir in a Celebration of VE Day. The Sub Prior & Bishop’s Chaplain Deacon Sarah Gillard-Faulkner preached at Evensong on Ester day following after the Bishop who preached over the Triduum. Well like any good Bishop’s Chaplain, here I am bringing up the rear! For those of you who are wondering if I’m being totally rude, I’m not, as in any procession of clergy the Bishops Chaplain, which I am, is always the last in. It has been a tremendous time spent with our Bishop remembering and celebrating what is the heart of our faith as Christian people. For unlike any other faith ours is one that proclaims and lives by the passion of our Lord and his resurrection. His passion paying the price for our sin and his resurrection giving us hope and the promise of eternity. But fundamentally what is the point in all this fuss? What is the point in spending a week of the year running round like idiots from service to service? So that ultimately we can be changed by these happenings. St Paul in the passage we heard from his second letter to the Corinthians tells them that Christ’s death and resurrection is a big change in the landscape of life. The happenings in Jerusalem on that first Holy Week, the news of the resurrection is the Good News that changes the way in which we should see things. These events then, and even so now, give us a new way in which to live. Paul challenges the Corinthians that they should be living cheerfully in this knowledge. For Saint Paul it has changed the way he looks at things from the old order of Judaism to the new life now found in the risen Lord. The Jews had expected the Messiah to be some purely human king who would conquer the enemies of God, build the temple of god, and establish a purely human kingdom. All such dreams must come to dust; that’s what Jesus’ death and resurrection has taught Paul. The way to the true kingdom is through death, and out the other side into God’s new world. So if we put together what he has learnt about other people and what he’s learned bout he Messiah, we get what he says in verse 17 one of the great summaries of what Christianity is all about: “So if anyone is in Christ, there is a new creation:” – the new creation he talks about is a reference to both the person concerned and to the world in which they enter, the world which, through his death has been reconciled to the creator. What has happened in and through Christ is not a matter of God claiming a world that didn’t belong to him, or making a new one out of nothing, rather it is about God reconciling, to himself his own world, his beautiful and beloved creation, after the long years of corruption and decay. But it goes a little further than that for us. Because we have been created and called in our discipleship to ensure that others know about the amazing cost and gift that awaits us because of this sacrifice and resurrection. We are called to life our lives in the new happening, to be the Beacon’s of this light and truth. 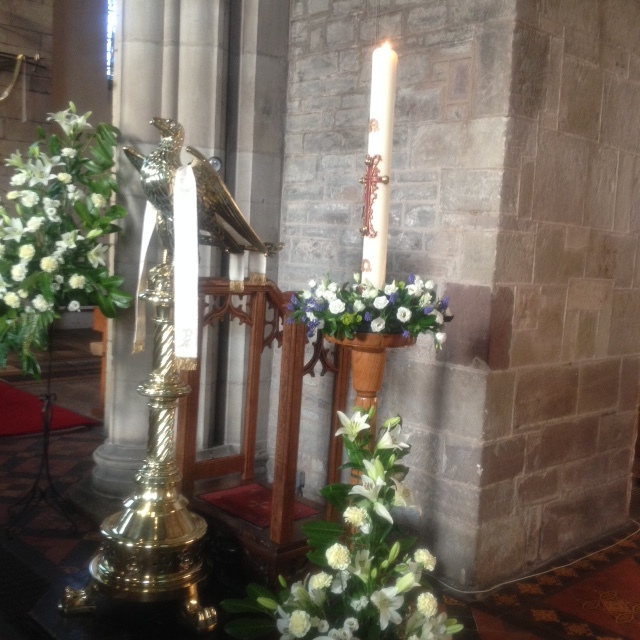 One of the joys and privileges I as a Deacon of God’s church get each and every Easter is to proclaim the resurrection and to carry the light of Christ in the paschal candle. I have to say I’m paying physically a little for it today, however, we all have been charged with the showing the way of light into the darkness of our world. We are to be that glorious new way of life in our world of today. I’m always perplexed when I see people on a Sunday leaving church some what sad and down. We have an amazing faith to proclaim that says there is hope, there is light even in darkness. Christ has paid the price of sin so that we can live lives of hope and light. So as the physical sun of today fades and night comes into being leave this place rejoicing in the new way that Christ has given us, so that all people may know that he is risen from the dead and that life forever is changed. Tonight I want to take you to the far north away to the twinned city of St Asaph and beyond. The City of St Asaph is one on Britain’s newest cities, created by the Queen as part of the celebration of her Diamond Jubilee but a few years ago. We have already gained a twinned city; not surprisingly the City of Glasgow in Scotland. You can immediately see why these two cities have been twinned, they are so alike. Glasgow that great metropolis, the largest city in Scotland; St Asaph equal in size and majesty. Glasgow the host of two great football clubs and St Asaph, the home of St Asaph United, for the over 14’s. These two cities are twinned because they are founded by the same person. In the Age of the Saints, one of the remarkable Saints of the sixth century was Saint Kentigern; Saint Cyndeyrn as we say in Welsh. Here was a Saint so renowned for his miracles and for his work that he became known more by his nickname than his real name, known to the Scots as St Mungo, which means “the beloved”. 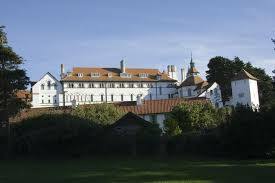 It was Kentigern or Mungo who founded the monastery on the banks of the Clyde River in Scotland, and who founded a monastery on the banks of the Clwyd River in North Wales. Perhaps it’s no coincidence that the river names are so similar. Kentigern was of course a Welsh Saint. In the sixth century the Scots did not live in Scotland but in Ireland, and the Welsh lived in Scotland with the Picts. It was a Welsh kingdom, the kingdom of Strathclyde, in which Kentigern lived and bore witness. The stories tell us he was driven out by a king who he had upset and he fled for his own safety to St David, who sent him to the north east of Wales, that most pagan and licentious area, in order to preach the Gospel to the north Welsh, a difficult task indeed. 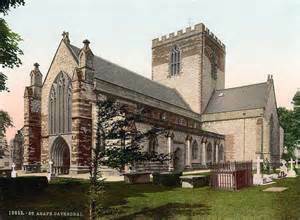 Kentigern founded a monastery at Llanelwy, at Saint Asaph, and brought it to enormous fruitfulness, living there for 30 years, until at last he was summoned back to the Kingdom of Strathclyde, and left behind his favourite pupil, his deacon Asaph, whom he identified to become the first native Bishop of the See. If ever you go to Glasgow you will find the influence of Kentigern or Mungo throughout the city. He is remembered with great affection and with great respect. Even the city’s coat of arms bears reference to the ministry of Mungo. These are his devices: “the tree which never grew and the bird which never flew, the bell that never rang and the fish that never swam”. The fish is actually quite important, because one of the great stories told of Kentigern was about a fishing expedition the he undertook. The King of Strathclyde, it is retold, probably the very king that exiled him, was angry with his wife. He had given his wife a great and beautiful diamond ring, the sort of present that loving husbands like to give to their wives. However, foul rumours reached his ears: his wife was having an affair and she had given away her ring to her lover. So the king went to see his queen and said ‘At the next feast, I want to see you at the banquet wearing that ring as evidence of your fidelity’. There was, the legend says, only one problem; the queen had lost the ring. She went to St Kentigern in a state of some distress and Kentigern took the lady fishing. They caught a fish and as they split it open to cook it for their tea, what should they find inside the fish, but the diamond ring, and all was well. There is a difficulty with this story. In north Wales we tell exactly the same story but about St Asaph. 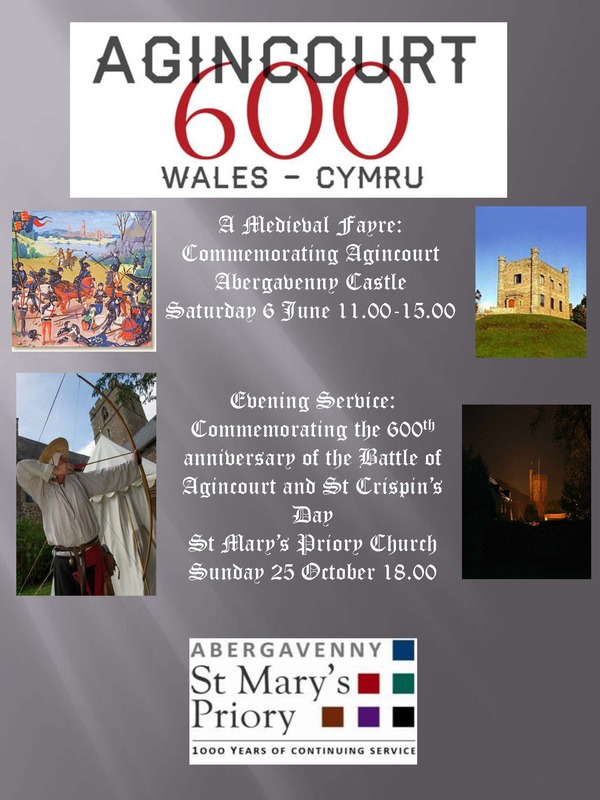 It is about St Asaph and Maelgwyn, King of Gwynedd. It was his queen who was given the ring, it was this queen who was charged with adultery, this queen who was taken on the fishing expedition by Asaph. It was Asaph who found the ring inside the fish, which is why the symbol of our Cathedral to this day is the fish holding the ring in its mouth. What is going on here? Here is a story told about St Kentigern in Scotland and a story which is repeated almost word for word about St Asaph in North Wales. Could it be that those outrageous Scots have stolen a Welsh legend and adopted it for their Saint? Might it even be the other way around? The truth is that many of the stories of the saints are told about different saints. Perhaps you’ve heard a story of the Saint who went hunting and in a forest nearly captured a wild hart, but he received a vision of the cross of Christ between the antlers and decided to spare the noble beast. 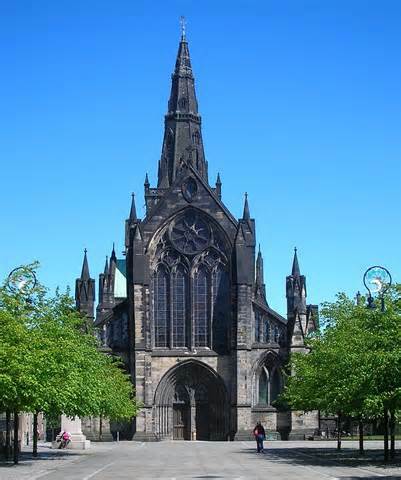 That of course was Saint Giles, or was it Saint Hubert? Or was it Saint Edmund? The same story is told about three different saints. I could go on, regaling for the whole evening, in a way which I’m sure you’d be delighted to receive, about stories of saints, told about one, swapped with another, stolen by a third, repeated about a fourth. There are those historians who would say that you must treat the whole thing with a healthy dose of scepticism. All these stories are convenient myths: they are stolen for one saint or another by their hagiographers. They’re there to entertain and to instruct and no-one ever imagined that the stories reported in one ancient manuscript would one day become available to and compared by all and sundry through the internet. Indeed, there are some who would say everything I have told you so far about Kentigern and Asaph and their adventures and their foundations were invented by Geoffrey of Monmouth. Geoffrey was a resident of Monmouthshire who went on to become Bishop of St Asaph. Where have I heard that story before? It’s said that in the 12th Century Geoffrey of Monmouth was eager to show how his diocese was actually of ancient foundation, and he made up the whole story of Kentigern and Asaph to show how ancient his see really was. 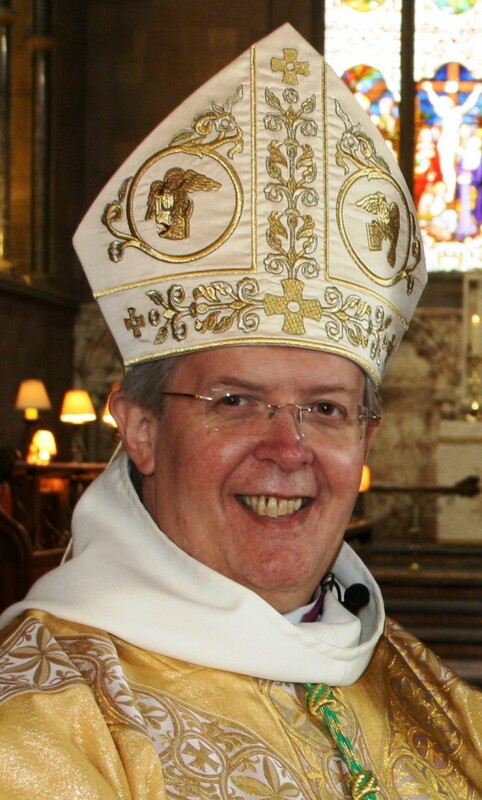 At this rate you might be leaving the church this evening wondering whether the Bishop of St Asaph believes in anything at all. But you see for me, in some ways, the stories of the saints are not important, in the sense of their historical truth. The stories of the saints are important because they are there to remind us what sainthood is about. The actual stories may or may not have happened, the actual stories may have been true of one saint or another, but the truth is that the memory of the saints were cherished because they all bore witness to the same things. And the witness that they bore was to the mercy of God and the justice of God. Look again at that story of the queen and her lost ring. When she was in a right pickle, where did she go for friendship and acceptance and encouragement? To the local Holy Man. That’s why all the Saints of the Dark Ages are remembered, whether it be David or Teilo or Woolos or Euddogwy or Samson or Cybi or Asaph or Kentigern. They were beloved by their people because the saints were people who opened their hearts to all who came to them, whatever their troubles, whatever their goals, whatever their sins. The mark of a holy man is the ability to know that you can go to that holy man or woman, and be accepted for the sake of God: not judged nor condemned, but liberated and affirmed as a child of our loving Heavenly Father. The mercy of God – and the justice of God as well is revealed for our lady queen in the story. She was in danger of a grave injustice, of being found guilty of an adultery that she had not committed. It was Asaph or Kentigern who was willing to stand up for the truth and for justice and was ready to speak the truth to power. That is another of the truths which is common to the stories of the Saints; that they worked unceasingly for justice and for the cause of truth. One of the fascinating things told about some of the Saints of the Kingdom of Powys is their readiness to stand up to wild Kings. We are accustomed to thinking, for example, of King Arthur as the very model of the perfect chivalric man. That one was actually down to Geoffrey of Monmouth as well. However, if you read the stories of Arthur in the oldest Welsh legends, Arthur is actually a bit of a rogue, a bit of a bandit, and it is the saints of God who must so often keep him in line. So what is it that binds this noble company of Saints together? What is it that is the common golden thread between all those Saints about who we will learn this Lent? It is the truth that they were a source of the loving affirmation of God’s grace and care. They are remembered and their memory cherished because they stood up for truth and for justice in the society of their day. Therein is the key to sainthood. Therein I might suggest is actually our vocation as Christians today. 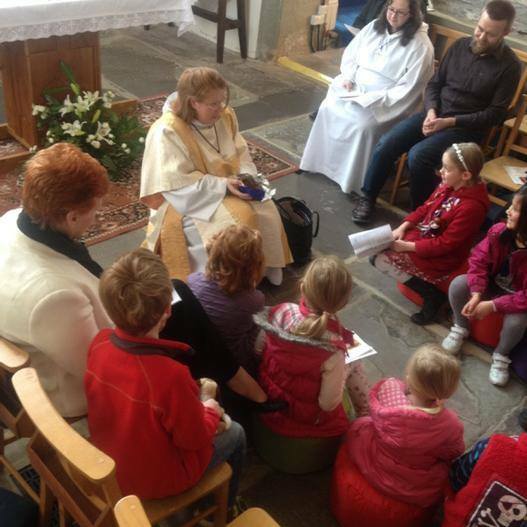 Is the Christian Church of today known as a place where, if people have troubles, they can come and be welcomed? Not judged, not condemned, not found wanting, but embraced by the love of God: a love so profound that His Son stretched out His arms upon the cross that He might draw all men and women to Him. Is the Christian community a place where the most needy and the most hopeless can be affirmed and find love? And is the Christian Church today a place where the disciples of the Lord will stand up for justice and truth? As it was for holiness in the Age of the Saints, so it is for holiness in our own day. For if we would bear witness to the love and glory of God, if you would like the reputation of our church to be cherished and remembered with affection, then let us be bearers of God’s mercy and let us be advocates of God’s justice. 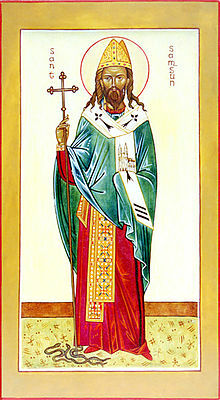 To talk of St Sampson [485-c565] is to speak of Celtic solidarity. The Celtic peoples of the far west of Europe, according to recent DNA tests, have far less in common with one another than the Anglo-Saxon peoples of the East of England and Scotland. 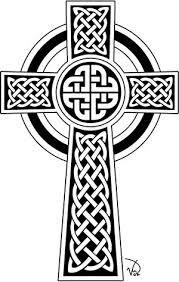 However, the Celts did have a religious identity of their own. In Church matters they had much in common with the Eastern Orthodox, which meant that they celebrated Easter according to a different calendar from that of Rome and their monks wore a different tonsure from that found in the Roman church. Canon G.H. Doble, who wrote the standard work on the Celtic Saints, reminds us that down the centuries it has been the Welsh language and the Christian religion which have held the people of Wales together. Sampson served this Celtic Christian identity outside Scotland, sometimes ruling as an Abbot, sometimes simply praying, sometimes evangelising and performing the sacramental ministry of a Celtic Bishop. His vocation was to meet various needs wherever he saw them and that surely is the object of all Christian ministry. Sources for his life unfortunately are the not totally reliable Celtic lives of saints [dating his own life, possibly the earliest of them, remains a matter for controversy] and the even less reliable twelfth century Liber Llandavensis. Nevertheless all these sources speak of a thoroughly remarkable man and it seems right to present him in terms selected from the various sources, in a way which gives coherence to his life. We thus can see him as great grandson of King Tewdric of Morgannwg, who had been martyred in battle with the English and buried at Mathern; as promising pupil of Saint Iltud at the educational establishment at Llantwit Major; and as a monk at Caldey, Llantwit’s daughter house, where he was ordained by the Abbot, Dubricius [Dyfryg]. Here an ancient inscription has been discovered in ogram, a system of lines and bars which served as written Welsh before the Latin alphabet was adopted. This inscription seems to speak of one who was the tonsured servant of Dubricius. However it was in Brittany, he made his greatest impact. It was at Dol, Privatus, a Gallo-Roman soldier gave him land for a monastery and here he became influential, intervening when he saw injustice in dynastic disputes and attending a council in Paris. He is regarded as one of the seven founding saints of Christian Brittany and his fame spread among the Anglo-Saxons. His relics, including an arm and a crozier, were in the 10th century, acquired by King Athelstan of Wessex for his monastery at Milton Abbas in Dorset. There is confusion in his life, basically because so many wish to claim him as their own. Would that our service for Christ could have such an impact! ARW.